Q. How do I save other peoples bookmarks? Bookmarks, when first created, are saved only in the creators ‘My Bookmarks’ section. They are then accessible only via lists they are added to. There will be some instances when you need to add other peoples Bookmarks to your own ‘My Bookmarks’ section in Readings. This saves you going through the process of creating a Bookmark from scratch. For example if you remove an item from a list that someone else created, you cannot re-add it unless you find the item and create a Bookmark yourself. To save this effort it is a good idea to add any bookmarks that others have created for your list to your bookmarks. To add a single Bookmark from a list to your personal bookmarks go to the item and select the kebab … menu. 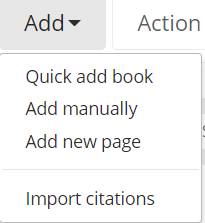 Select the first option ‘Add to My Bookmarks’, the item will now appear in your personal bookmarks list. 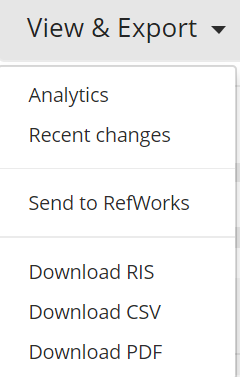 Select Download RIS- Name and save the file so it is easy to retrieve. 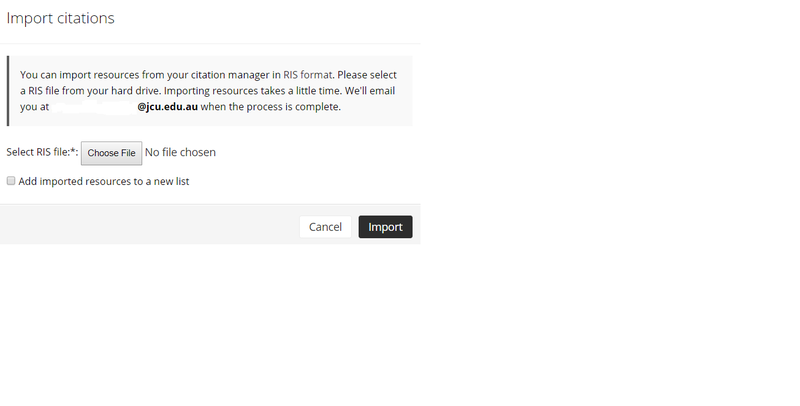 Select ‘Import citations’-the below window will appearSelect Choose File and choose the RIS file you just saved, once this is done select Import. 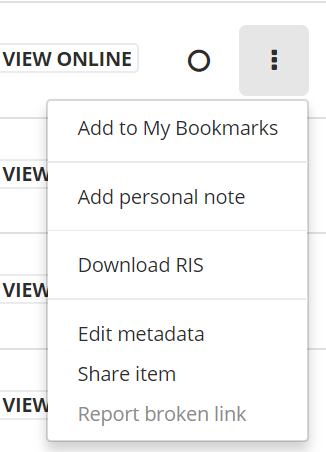 The items will now appear in your personal Bookmarks section.